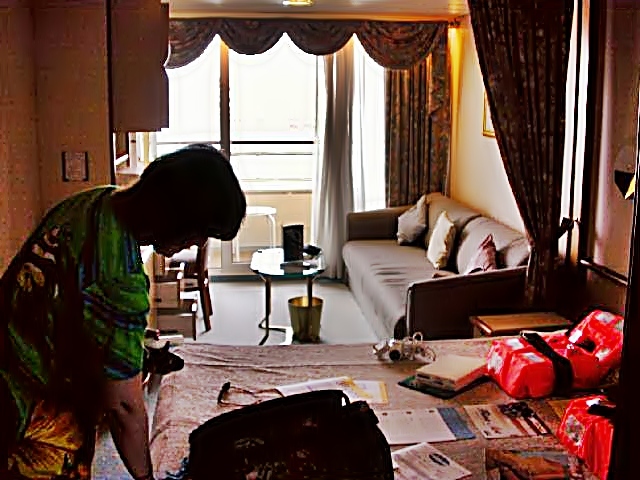 and Dad's First Cruise (aboard a cruise ship)! 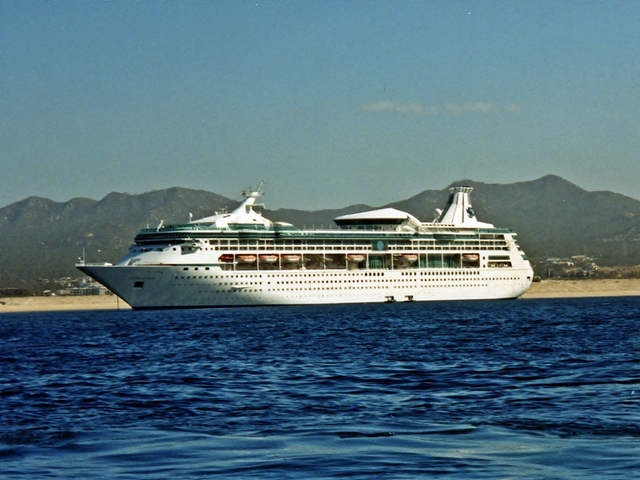 This is a newer ship then Grandeur of the Seas, and again, she's somewhat larger at roughly 78,000 tons. She's also markedly classier then her sister- much cooler artwork throughout the ship and less glitzy then Grandeur. Her dining room, the Aquarius, is much brighter then the subdued lighting on Grandeur's. Food preparation and service seemed a big improvement over both the Majesty and the Grandeur but the bar waiter in the dining room was just plain terrible. Food taste was impeccable- even in the oft maligned Windjammer Cafe. The Windjammer on Vision was quality all the way. 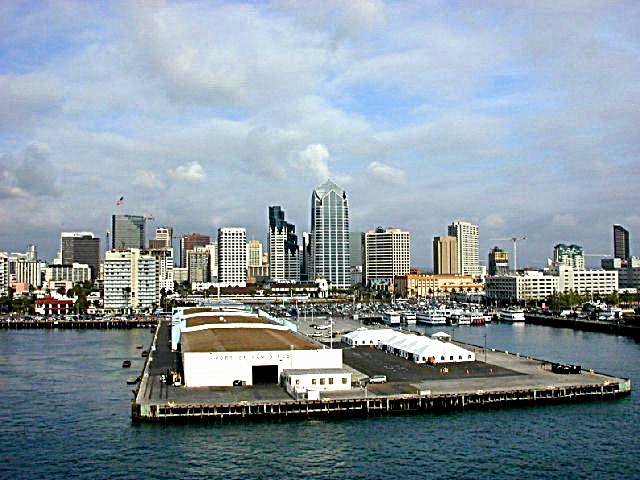 Port of San Diego... our view on departure! This Cruise was our first with a balcony cabin and BOY ARE WE HOOKED! How did we ever live without one? The cabin was #7066 located on deck 7 (Commodore Deck) not too far from the Centrum which is an excellent landmark for getting around this gorgeous ship. The cabin featured two twin beds (already meshed together as a queen- Hooray! ), a small "living room" with a couch (which doubles as a fold out bed) and table. Across from these was the gargantuan make-up table (which Diane loved) and plenty of drawers for clothes. In this same assembly was our safe, TV and small refrigerator (which our cabin steward always kept full of ice!). The bathroom was the BIGGEST yet in a typical passenger cabin - at least as big as my bathroom at home. There was probably enough room for three people to fit in it- not that we plan large parties in the bathroom. The shower had a circular wrap around curtain and adjustable/removable shower head and shampoo dispenser. There was also a hairdryer in the room as well as bath robes! Our very first balcony cabin! The Crew and Staff for this cruise were incredible- every soul I passed always has a quick smile and/or "Hello!". All sales aboard were completed with "It's been my pleasure!" The Vision of the Seas and her staff are to be commended for their excellent and professional customer service. Even the ship's Captain was funny, telling jokes at the captain's reception party. I've never seen a captain do stand up! The passengers were all having a great time. Update 2009: Almost sounds like Captain Johnny aboard the Mariner of the Seas in 2008. I wonder if it was? It's a shame I didn't record his name here. The shows aboard the ship, which were housed in a wonderful theater, were only okay (I've seen much better acts on the line's sister ships) however, the RCCL performer's show, Rhythm Nation was a spectacular review. The comedians were very good as well. 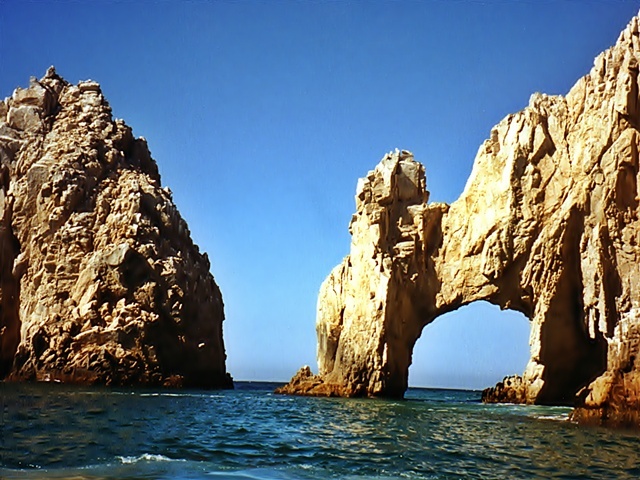 Our ports of call were good to great in the order of visitation: Cabo San Lucas is a naturalist's dream where you can see sea lions sunning themselves on exquisite rock formations (Land's End) and Cabo also has some nice beaches. 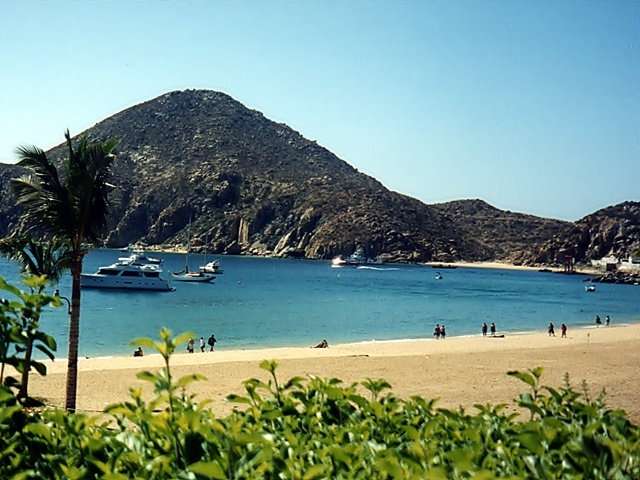 Lovely beach at Cabo San Lucas... but the water was cold! 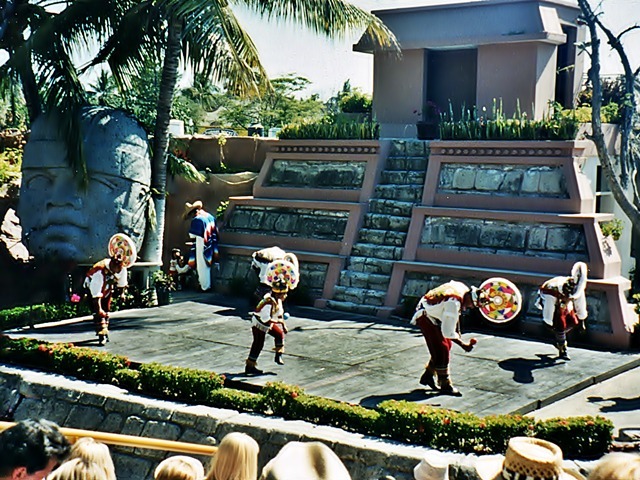 Mazatlan is a shopper's paradise and the Papalanta dancers (not to be missed here) are a great slice of Mexican traditional dancing. The beach resort we visited (Los Sabalos) on our side trip had a great beach and nice Mexican buffet! 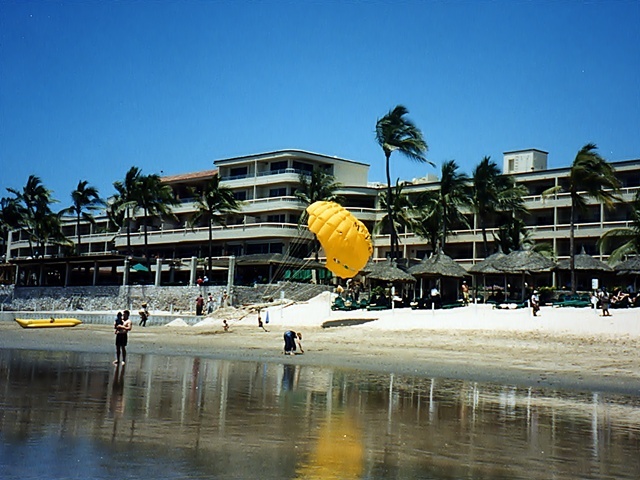 The wonderful Los Sabalos beach resort! The Papalanta Dancers... excellent show! 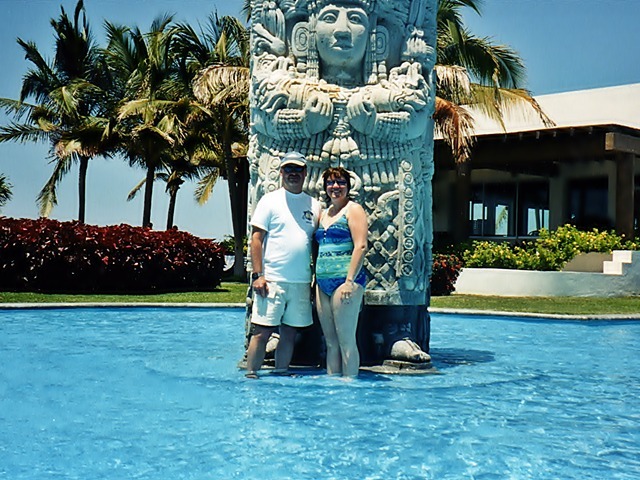 Finally, Puerto Vallarta was the gem of the bunch- we visited the gigantic Mayan Palace complex with it's enormous pool and beaches. Puerto Vallarta was much more cosmopolitan in outlook. As you'll notice, all of our side trips included beaches and I should point out that there were people selling wares on all three sites- mostly in Cabo but very few in Puerto Vallarta. None were rude and all knew the meaning of "No thank you..." (Unlike the beach hawkers on Grenada). 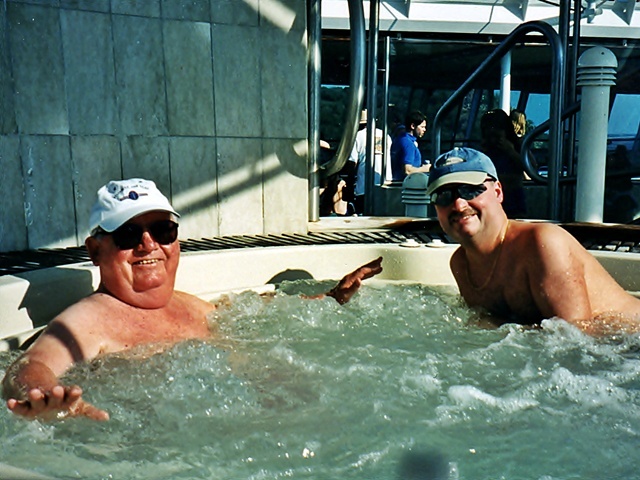 Dad and I in one of Vision's hot tubs! 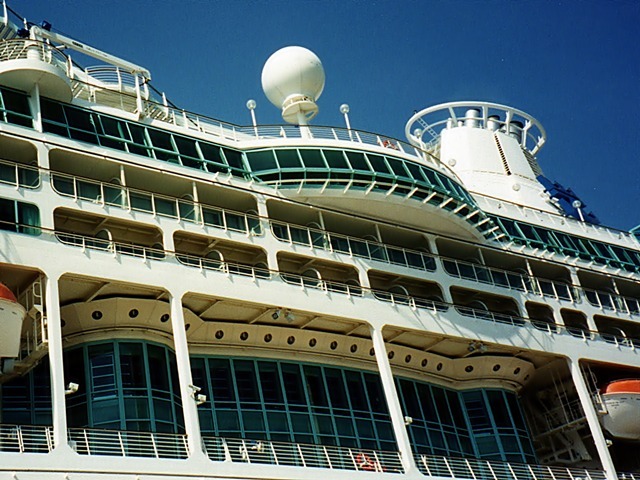 Although Vision of the Seas is small compared to today's behemoth sized ships, she still looms large in this photo from the port looking way up at the intricate details starting at the deck 5 Promenade at bottom and looking all the way to topside where the pool deck is located. 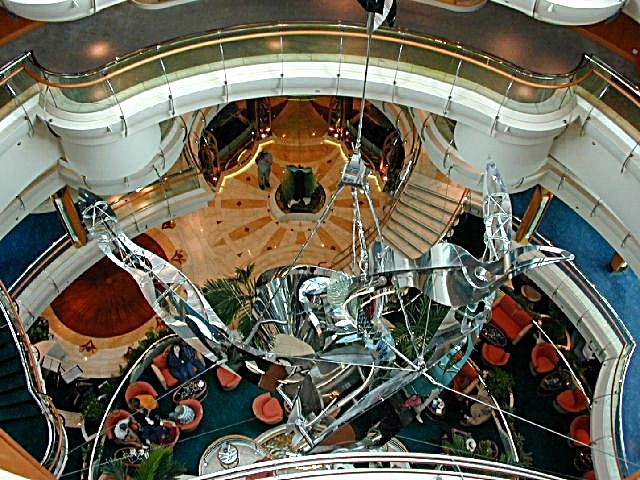 Vision of the Seas was truly a vision to behold... a ship I'll always remember fondly. The pictures on this page were digitally remastered by me from film photos. To see other photos from this terrific cruise, press HERE!